FIFA 11 (FIFA Soccer 11 in North America) is the 19th title in Electronic Arts' FIFA series of football video games. Developed by EA Canada, it will be published by Electronic Arts worldwide under the EA Sports label today in North America, 30 September 2010 in Australia, and 1 October 2010 in Europe for all platforms, except the Wii. The Wii version will be released on 3 October 2010 in North America and Europe. The Windows version of FIFA 11 will be the first in the series to use the same game engine as the PlayStation 3 and Xbox 360 versions. 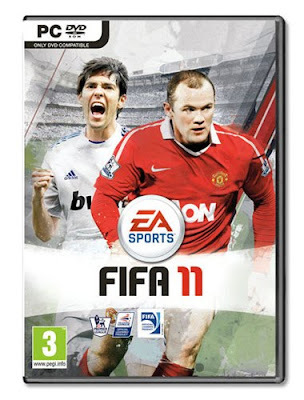 FIFA 11 will feature different players on the cover in each region, though Kaká will be featured globally. A FIFA 11 demo was released for PS3, Xbox 360 and PC on 15 September 2010. The demo features Chelsea, Barcelona, Real Madrid, Juventus, Bayer Leverkusen and Lyon, although Arsenal can be unlocked on the PS3 and Xbox 360 by playing FIFA Superstars on Facebook or by winning 5 matches in the demo. The stadium for the demo is Real Madrid's home stadium, Santiago Bernabéu, but the Emirates Stadium can also be unlocked through FIFA Superstars. It will also be unlocked after you have played 10 matches in the demo. Reciprocally, by playing the FIFA 11 demo, users can earn rewards for their FIFA Superstars team.